Give your social life a boost by doing fun things with your friends! Gomo (Go Out More Often) brings real-friends together through real-life shared experiences. 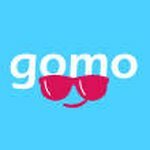 There are endless activities, places and events to discover on Gomo -- this app is your solution to Fomo! Finding things to do has never been easier. Swipe. Match. Go. Swipe right on activities that interest you, match in group chats with friends interested in those same activities, then text each other to go do them; it's that easy with Gomo - Go Out More Often! Are you bored of doing the same things or wasting your time searching online for new and exciting experiences? Then, when you're lucky enough to find something interesting, you struggle to find someone to go do it with? This app eliminates those hurdles. Gomo makes it easy to discover activities that you'll like and know which of your friends are just as excited about them as you are. Gomo is currently available in Colorado. Find things to do in Denver and Boulder!